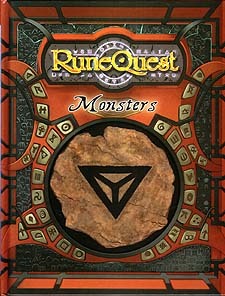 Runequest Monsters is an invaluable resource for any Runequest game, containing listings for over 150 monsters. Within these pages is a host of creatures to populate any RuneQuest setting. They range from the ordinary and familiar, creatures of the natural world such as bears and snakes, to the fantastic and alien, creatures born of Chaos, magic and the spirit world. Runequest Monsters also provides information on how to create a full-fledged characters using the various sentient races found within the book and rules for crafting armour from the hide of your foes.